This entry was posted on Monday, June 2nd, 2008 and is filed under Dairys, Food. You can follow any responses to this entry through the RSS 2.0 feed. You can leave a response, or trackback from your own site. My grandfather was Isaac Webster, the founder and owner of Riverside Dairy and Webster’s Ice Cream Stand on Merrimac Street. It’s a shame that these buildings are being demolished and will be replaced by sailboats. It’s important for Newburyporters to remember the past and what was the foundation of Newburyport. If you have any older or present pictures of the property, I’d love to display them here. I always wondered if there was a connection between the two businesses. Now I know! If I was to make a guess I would bet most of the boats that are going to be stored on the Webster/Riverside site are for boat owners who do not live in NBPT , but like how their boat looks going down the NBPT section of the Merrimac River. Ahh…Websters. Best Ice Cream, Meanest lady. Good old “Ruthy”. She made every trip to Websters and event. Also…my Neighbor, Pete Daigle used to drive a Riverside Dairy Milk Truck. He ended up buying one and converting it into a camper. They had a “lot” up at Tewsbury Pond. 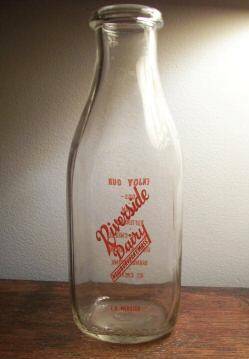 My grandfather, William Collis, supplied the milk to Riverside Dairy up til the mid-fifties. He had a large barn where the cows were milked, that was located on the site of the Nock Middle School, and a large amount of acreage across Low St., where the cows grazed. I WORKED FOR THE WEBSTERS AT RIVERSIDE DAIRY THEY WHERE THE NICEST PEOPLE I HAVE EVER WORKED FOR. I live in Amesbury and we are renovating our house, which had the same owners from roughly 1915 to 2006. 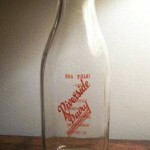 We were delighted to find a milk bottle cap fro Riverside Dairy. Happy to provide a copy to anyone who wants it! My father drove a milk truck with Pete Daigle – boh ended up coaching in the Pioneer League. Chris Webster – worked with him at two different companies in the ’80s and 90’s – and we still stay in touch! My mother, a cousin of the Webster’s worked off and on for Webster’s, my older brother drove a milk truck for a short time, and my sister, my younger brother and I all worked at Webster’s. My first job was shoveling water in the basement. When I went to the Currier School, I loved going to to have lunch at Webster’s. To be able to get up on the spinning stool seats and getting a refreshing cold drink of water in the paper cups that rested in the stem on a holder, not to mention the grilled hot dog, french fries and chocolate frappe. After shoveling water for a time, I began to wash dishes. I learned how to move ice cream from the freezer into the places out front and also learned to scoop ice cream and wait on people at the window and also waited on people at the counter. To some people Ruth may have seemed mean, but she taught me quite a bit about responsibility and cleanliness in the workplace. Everybody has a bad day and when you are running a place that serves people food, I would think that anyone would feel the pressure of attempting to keep the quality up to snuff at all times as well as teach high school age kids about business. There were also days when they made ice cream in the back of where the dishes were being cleaned and I was often offered a cup of just made ice cream, but to their consternation, I only liked vanilla and chocolate at the time. However, I do miss the ice cream because I have never tasted anything better since. It was a wonderful place for a high school kid to learn responsibility and earn a little spending money. It would be a travesty to see the buildings demolished, just for sailboats. My dad, George Woundy, except for a time during WWII, worked for “The Dairy” pretty much all his life. They had milk and ice cream that was the best! Their Pistachio ice cream was a treat for me and to know that my dad sometimes made the ice cream was very special to mel. People speak of Ruth as being mean, and to tell the truth she reamed me out pretty good more than once, but she made sure the Ice Cream Stand was top notch. Her brother Ray was a great guy and their parents Ike and Ruth Webster were very special to my dad from when he was a lad in his teens until he retired. Time moves on, things change and eventually the dairy had to close, but I’d give anything to see that stand open again. My father was a veterinarian next door to the Webster’s, and the ice cream stand was on the other side of us. We lived there from 1946 till 1953. The twins Patty and Prudy were very memorable as well as Kay Martha. Black raspberry ice cream from Websters, my favorite! We lived almost across the street from the Ice cream store and restaurant, there was a pony on a tether grazing there in those days and I was pony-crazed – petted it a couple of times… my friend Kathy Warwick worked there under Ruth, I am sure it did her (Kathy) lots of good! I was too shy to even think of working with the public, but Kathy was always great with people. Barefoot, summer, ice cream and the smell of the river…good old Newburyport! I lived next door to the Websters from ’69-’80. i have never had an ice cream sundae that compares to Ruthy’s. A little off the main topic, but seems like the best place to share. I probably spent as much time in, out, and around their house and property than my own. Grandma Webster as I called her let me help in the garden and baking her Christmas cookies she would deliver in gift wrapped shoe boxes. i was also her text messaging service i was there so much. Running from the house to the Dairy office, the Websters house next door, PWP, or the ice cream shop. Mr. Webster taught me to ride his ponys and take care of them after. Every time I hear the introduction to Days of our lives i automatically picture Mr. and Mrs. Webster in their recliners. They are still loved and much missed. but the incredible memories will remain in my heart for ever.